"WeissCANNON 6StarString Supercharged - Take it to the courts...You'll have a blast!" Siegfried Weiss, owner and founder of WeissCANNON, has already used his engineering background in fibers technology to create the most technologically advanced and best playing poly based strings currently on the market. (WeissCANNON Silverstring and the amazing TurboTwist.) For an encore, he drew upon his engineering experiences and created what is arguably the finest performing multifilament string produced to date, Explosiv!. Now, for a curtain call, he has introduced another new product, this time twisting elements of monfilaments and multifilaments together to produce an entirely new breed of string. The 6StarString Supercharged is a unique blend of technologies finely tuned to produce a unique string that has players across the globe reveling in victory. The unique purple hue literally screams "I am unique" while leaving opponents decimated and aching to add the "Power of Purple" to their sticks STAT! Construction: A mono-multifilament. This is a successful blend of multis and monos that are comprised of innovative fibers. The twist technology is utilized to enhance spin potential. The result is a string offering that is unique in performance. Advantages: An outstanding combination of power, control, spin potential and durability. Color: Purple, Natural and Deep Blue. Why we carry this string: The 6StarString Supercharged is an updated and improved version of the original version of 6StarString. It remains a unique string with many potential applications. It can be used as an alternative for multi users seeking a string with added durability. It can be used as a cross string in hybrid with poly-based strings. 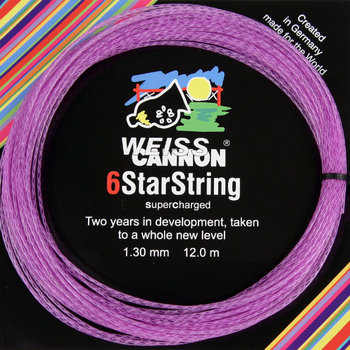 WeissCANNON has developed inventive poly-based string offerings as well as a multifilament string with remarkable tension maintenance. Now, for an encore, they have introduced yet another innovative string product. This time they have twisted elements of monfilaments and multifilaments together to produce an entirely new breed of string. The 6Star Supercharged is a unique blend of technologies finely tuned to produce a unique string that has players across the globe reveling in victory. The unique purple hue literally screams "I am unique" while leaving opponents decimated. Construction: A mono-multifilament. This is a successful blend of multis and monos that are comprised of innovative fibers. The twist technology is utilized to enhance spin potential. The result is a string offering that is unlike any string in the market today. Comments: The 6Star Supercharged took nearly 3 years to develop. It was originally introduced as 6StarString but based on player feedback was enhanced further to become the product that currently available. 6StarSupercharged offers the playability of a crisp multifilament string with enhanced durability and excellent spin potential. Why not conduct a personal playtest today? We have tried to make it easy by allowing you to place a set or more in your shopping cart directly from the left column of this page. Please follow the WeissCANNON 6Star Supercharged 660' Reel link if you prefer to save money by ordering in larger amounts. My opinion of this string is it's comfortable, has spin potential, good power but its control is less than Weiss Cannon Scorpion 1.22.